The best part of this day–or any day this week, to be honest–was when Bridget and I sat across from each other in public making sound instead of articulating words, and laughing our asses off. We met to discuss the anthology of true stories that she has worked to put together over the last five months–and we’ll get to that, I swear–but I use this moment to demonstrate a basic truth about people like Bridget and me: we don’t like small talk. We would literally screech and creak and honk and attempt accents at each other than talk about the weather. This avoidance of small talk is, of course, the underlying conceit of her story anthology, “A Book of Revelations,” which compiles stories, poems, visual imagery, and other writing from 22 Detroit-based (or Detroit-spirited) contributors (full disclosure: I am one of the contributors). 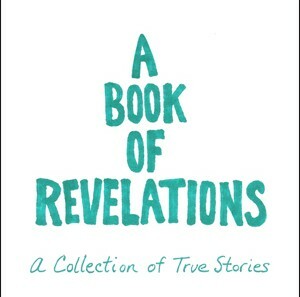 Revelations are big talk, big stories–true stories, Bridget emphasizes. But I think revelations go a bit beyond that, actually. A moment of revelation is not just a true story, it is a moment where you see truth. It is a true story to say I ate a cinnamon roll on Thursday. It is a revelation to say I realized that this could be the cinnamon roll that gives me adult-onset diabetes, and I need to get my act together, nutritionally. Often, it is a truth you already know on some level, that has been staring you in the face; the revelation is the moment where it travels from your head to your heart. It is typically a transformative moment, and that Bridget is determined to collect these moments in this (hopefully) ongoing series is a pretty powerful and telling revelation about her, in and of itself. I sat up last night and read this book cover-to-cover, and I have to tell you, it is full of exactly those moments of seeing truth. It is also one of the Detroitest books I’ve ever read. This place is the city of revelations. Things are changing on this score, but when I first came here, I was struck by the absolute lack of pretense, of facades. The facades had literally crumbled, decades ago. It was come-as-you-are, and I was so, so relieved to have found a place where I could just be me, whoever that was. Even with Detroit’s help, it took me a while to figure it out, and that process is still ongoing–more, as they say, will be revealed. But something about this collection rings exceedingly true to the basic revelation of life in Detroit, and I think that’s a credit to Bridget, who keeps it absolutely more real than almost anyone I’ve ever met. You want in?! Good news: the book premieres tonight at the opening of TURNOVER A SPREAD, a book show at Holding House! There’s a post for another day about the sudden and welcome preponderance of art book shows lately; for today, I’ll just encourage everyone to come on out for the opening. There will be books! There will be drinks! There will be readings and revelations! Turn up and prepare to TALK BIG.